No one would've blamed you if, before watching him take a reverse to the house and then Prime Time his way to a record-setting 20th return TD last night, you had forgotten that Devin Hester was even in the league at all. It's been a few years since he's done anything notable, but his brief re-emergence last night was a glimpse both of what Hester once was and what he might've become, had things broken a little differently for him. 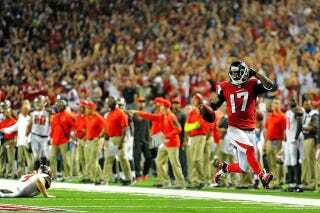 Hester is, without question, the greatest return man ever to play. Last night he claimed the return-TD record from Deion Sanders, who got most of his touchdowns off interception returns. But even that big number—20!—doesn't bear out what a disruptive force Hester was in his prime. Hester got his first 12 return touchdowns—all on kick, punt, or field-goal returns—in the first two years of his career. The great thing about watching him then was how directly he'd go from 20-yard line to end zone. He never did much wiggling or reversing field; he'd just run straight ahead, jab his legs and swing his hips for a quick juke or two, and then blur his way down the field. It's not an exaggeration to say that during these first few years, the Chicago Bears' formula for winning games was to play stout defense, hang in there on offense, and wait for Hester to swing the game on a return. And then everything dried up. Hester amassed 152 kick and punt returns in his first two seasons, and covered 2,713 yards while terrorizing special teams units across the league. In his next two seasons, Hester totaled 47 returns, ran 610 yards, and scored zero return touchdowns. This was partly because teams began kicking away from Hester, and partly because the Bears began deploying him less and less on the kick-return team so as to groom him into a proper wide receiver. The receiver experiment never quite worked out. Hester never caught more than 57 balls in a season, never tallied more than 757 receiving yards, and never put up more than three touchdowns. His return game had a brief resurgence in 2010 and 2011, when he housed six more touchdowns, but he was never again the world-busting force he was in those first two seasons. You watch that highlight reel above and you wonder how the Bears never managed to turn Hester into an offensive weapon. I can't help but think that if he had entered the league a few years later and enjoyed his prime in one of today's more innovative offensive systems, we would have seen a more liberated version of Devin Hester. Take a look at Percy Harvin, who's part kick-returner, part wide receiver, part read-option cog, and part running back. In 57 career games, Harvin has carried the ball 113 times and scored five rushing touchdowns. Hester has 30 carries for 80 yards in his career. What could Hester have done as a member of today's Seahawks? Or the Eagles? Or, hell, even the Vikings, who appear bent on turning second-year speedster Cordarrelle Patterson into a dual running and receiving threat? Hester seemed to posit and answer the counterfactuals himself at one point. Before he went speeding down the field on his record-setting return, he took a handoff on a reverse and ran it in for a 20-yard touchdown. It was the first rushing touchdown of his career, and the longest run of his career. And it was something we should've seen a dozen times before.